Looking for kitchen extension ideas for your period home? If your current kitchen simply isn’t big enough to include all the elements you would like, then adding a kitchen extension could give enough space to create the perfect heart of the home. As well as being practical, it is critical that the design enhances the look of your house. This could mean that your extension is traditional, and in-keeping with the style and materials of the original architecture. Alternatively, it could mean adding a contemporary, minimalist, light-filled addition that will show how your property has evolved over time. Don't forget, that if single storey and to the rear of the property, your kitchen extension may not need planning permission. We’ve rounded up a selection of our favourite kitchen extension design ideas designed for period homes to offer plenty of inspiration when coming up with your own design. Find out all the practical advice you need to add a kitchen extension in our guide. To enlarge this five-bedroom Victorian house in Essex, a timber frame kitchen extension was added. It features a vaulted ceiling to add to the feeling of height in the room, while French doors and a feature window offer great views of the kitchen garden outside. The garden room blends to the style of the house, and looks as though it has always been there. As well as being a practical family space, the new kitchen also doubles up as the location for a cookery school. This meant it needed to be big enough for a large dining table and include plenty of preparation areas. Find out more about adding a timber frame extension in our practical guide, and find more information about extending a Victorian home to get your addition just right. Proving that contemporary kitchen extensions can enhance period buildings, this stunning design was added to a Gothic tower in the Somerset countryside. The large addition has full-height sliding glazed doors to maximise the views of the beautiful walled garden and the adjoining tower. Once the doors are opened up, it’s the perfect indoor-outdoor living space. Find out how to plan and design a glass extension in our guide. The bespoke Shaker kitchen units have been painted a neutral colour to ensure nothing detracts from the stunning garden views. For a sleek finish in keeping with the style of the extension all of the appliances are built in, with many concealed behind cupboard doors. Located in a conservation area, this Victorian semi-detached cottage was completely renovated, with a green oak frame extension added to the ground floor to increase the living space. As the cottage is next to the village church and surrounded by listed buildings, natural materials such as oak, slate and weatherboard have been used as they will weather softly over time to ensure the extension is a sensitive addition. A glazed wall and roof lights overhead ensure there’s plenty of natural light – if light is something that's important to you, have a look at our light filled extension design ideas gallery. Find out more about building an oak frame extension in our guide. In large kitchen extensions, a central kitchen island can offer a practical work area as well as creating a focal point in the space. Opting for a curved design helps to soften the overall scheme, with the overhang at one end of the island making the perfect spot for a breakfast bar. The solid oak cabinetry has been teamed with sleek worktops creating an eye-catching effect. Use our guide to the best types of kitchen worktop to help you choose the right ones for your new kitchen. The kitchen of this six bedroom townhouse in London has been extended to increase the storage potential of what was previously a relatively cramped area. Also, there’s now room for a spacious dining area in the new conservatory by Vale Garden Houses. In keeping with the period property, the kitchen features Edwardian-inspired handmade cabinetry painted in Dove Tale and Mole’s Breath (on the dresser), both by Farrow & Ball, with a bespoke table and dining benches made to match. Antique mirrored glass splashbacks used on both sides of the galley reflect the light. Find out more about how to plan and build a conservatory or sunroom in our practical guide. Adding bi-fold doors to your kitchen extension is the ideal way to join your new space to the garden area or terrace, as in this extended bungalow – try Vufold for similar timber framed doors. To create a seamless transition between the spaces, opt for the same flooring indoors and out, though make sure you choose a textured, non-slip design for the exterior area. The country-style kitchen is handmade from Quebec yellow timber with the cabinetry painted in Farrow & Ball’s Elephant’s Breath and Charleston Gray. Maple worktops add a subtle warmth to the space. Find out more about choosing the best kitchen flooring in our guide. Adding a kitchen extension that brings in plenty of natural light opens up the possibility of choosing bolder colours on your units without the worry of the space feeling dark and enclosed. 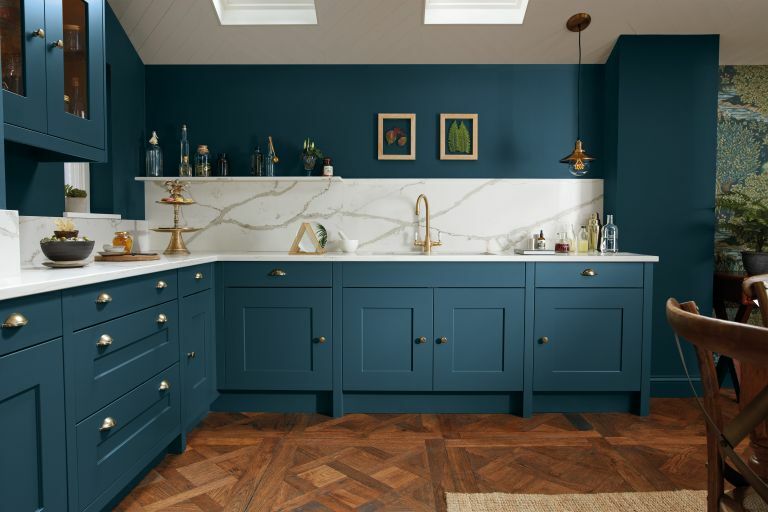 In this Edwardian property, the owners opted for a hand-painted design with an kitchen island unit in a dark blue that contrasts beautifully with the paler shade used for the cupboards around the walls, the Corian worktops and the wood flooring. A secret door, which you could be forgiven for thinking opens into a larder cupboard, actually provides access to a utility room. Planning your own utility room? Check our handy guide for advice. Traditional oak frame kitchen extensions are ideal for period properties as the exposed oak beams will add instant warmth and character to a space, as shown in this Grade B-listed steading conversion in Scotland. Complementing the timber used for the structural framework, the wooden kitchen features matching solid oak worktops, a breakfast bar and dining table, with the colourful units painted in a mixture of French Gray, Brinjal and Green Smoke, all from Farrow & Ball. Find out more about adding an oak frame extension to your home. This Victorian terrace in London had a typical layout with a small, narrow kitchen at the rear of the property. Extending into the empty side return space has turned what was previously an unused area alongside the house into valuable extra living space, creating room for a more flexible kitchen-diner. A modern frameless rooflight has been combined with steel-framed doors that complement the period style of the property, while exposing the brickwork of the party wall adds character to the finished scheme. Find extension design ideas for your Victorian home, and check out our guide to adding a side return extension to make the most of your space. Situated in a conservation area near Cambridge, this part timber-framed historic cottage had been previously extended but was suffering from rot in its main structure. As major work was required to resolve the problem, the owners decided to take the opportunity to double the size of the ground floor by adding a new open plan kitchen extension that would become the hub of their home. The ground floor space is now perfect for family life and entertaining, with folding sliding doors leading out from the dining area to a garden terrace. Find out how to design the best open plan kitchen for your home. The original kitchen in this Grade II-listed house was located in a small room at the back of the house, which didn’t suit this family with three children. It took two years for the couple to secure planning permission for an extension. As they weren’t allowed to remove any internal walls, it was decided that a new garden room extension would be the best solution with Georgian-style glazing helping it blend in with the original property. The bespoke kitchen cabinetry is a mix of New Classic and English, with granite worktops and units painted in Pointing by Farrow & Ball and the island in Tarlatan by Paint & Paper Library. Find out more about adding an orangery-style extension to your home. When the owners of this Arts and Crafts cottage near Oxford wanted to extend their home, they were keen that the new addition should be sympathetic to the style of the original property. Designed as an open plan space, with a sofa by the garden doors and a breakfast bar at one side of the central island, the extension can also be opened up to the more formal dining room next door thanks to the folding panelled doors that link the two spaces. The bespoke kitchen has been perfectly tailored to the couple’s needs, with Silverstone cabinetry in solid bleached oak and a large island unit housing drawers of varying sizes to accommodate all of the couple’s kitchen essentials. Keen to create an open-plan space where the whole family could cook and eat together, the owners of this Grade II-listed detached property chose to add a traditional orangery-style kitchen extension to their home. The 7m x 6.5m space features two glazed roof lanterns above the kitchen and dining areas, solid wall sections to accommodate the kitchen units and elegant arched doors leading out to the adjoining patio area. The timber cladding to the roof structure is painted in Putty for an elegant, traditional feel. Use our guide to find out how to build an orangery. Even a small kitchen extension to a period home can create enough space for a more flexible open-plan kitchen, as in this Victorian house in east London. The simple glazed addition overlooking the garden is the ideal size for a family dining area alongside the bespoke kitchen. The Classic Painted kitchen in Farrow & Ball’s Teresa’s Green has been combined with a Leather Tigris Sand composite worktop and whole-stave oak worktop on the island that echoes the wooden design of the dining table. Adding a striking kitchen extension has given the owners of this Edwardian home in St Albans the bright entertaining space they felt their home was missing. Featuring a high, vaulted ceiling and plenty of glass to maximise the natural light, the kitchen is designed around a central island unit that forms the focal point of the space. Designed by C&C Kitchens of Enfield, the 1909 half pencil & scalloped in-frame kitchen in Charcoal and Partridge Grey has been teamed with Carrara marble surfaces for a classic combination. When the owners of this Grade II-listed house near Hungerford approached Stephen Graver to design a kitchen for their new extension, their brief was to create a welcoming family space with plenty of kitchen storage. The couple didn’t want to include wall units, however, as they liked the idea of using the wall space for displaying favourite pieces of artwork. Teaming the kitchen cabinets with pantry-style cupboards either side of the fridge-freezer and a matching dresser at the far end of the space, all painted in Great White by Farrow & Ball, ensures their storage requirements have been met. Find out how to design a kitchen from scratch in our guide. Kitchen extensions ideally need the input of a designer to ensure the new layout will make the best use of space, such as in this extended five-bedroom home in the Cotswolds. To ensure the extensive views over the surrounding countryside can be enjoyed at any time of the day, the main food preparation area and workspace on the island unit face out to the glazed gable end of the room. The kitchen is handcrafted from solid wood with an island in lacquered oak and a freestanding dresser painted in Verdigris. Find out how to cost your kitchen extension in our planning guide.